Today Meridian Momtourage launched a brand spanking new site design, including interactive features to further engage its audience. Meridian Momtourage is a community-based site where local New Jersey moms can learn from each other, share experiences, and grow together to make motherhood a fulfilling and enriching experience. The site is owned by Meridian Health, but don't be fooled. Not all topics on the site are health related. You can find everything from health to food to fashion and more on the site. 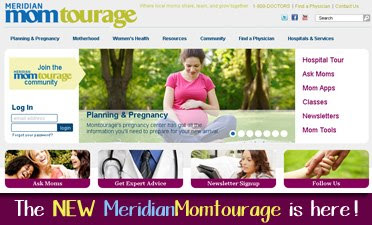 Through expert physician articles, member discussions, and in the trenches blog posts from contributors who are actual moms with real-life failures and successes, Meridian Momtourage caters to the expectant, new, and experienced moms. Head over, create your profile and start mingling today! Disclosure: I am a member of Meridian Momtourage's Mom Blogger team. I was not asked to write this post nor was I compensated for writing it.